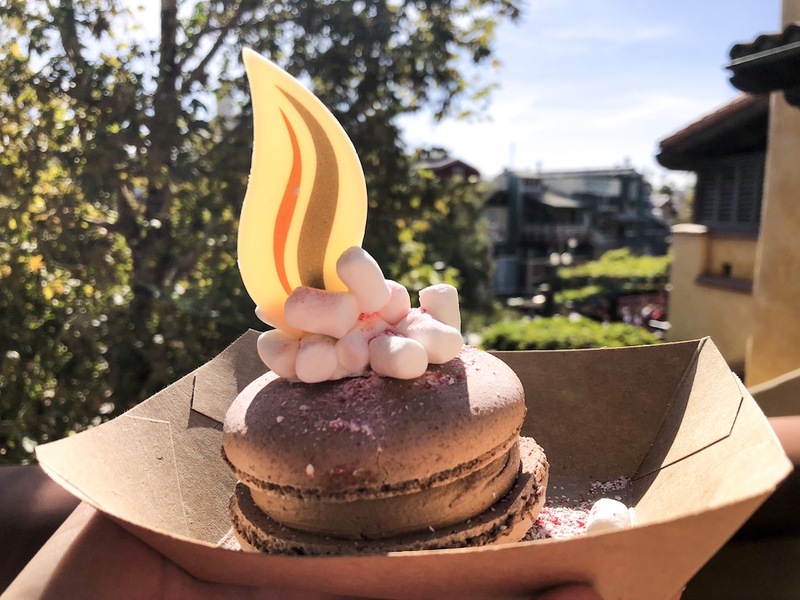 The holiday season is upon us, which means it’s time to bust out the holiday gear and head to the Disneyland Resort to see all the twinkling lights and festive décor, then eat all the new delicious seasonal offerings before they are gone. 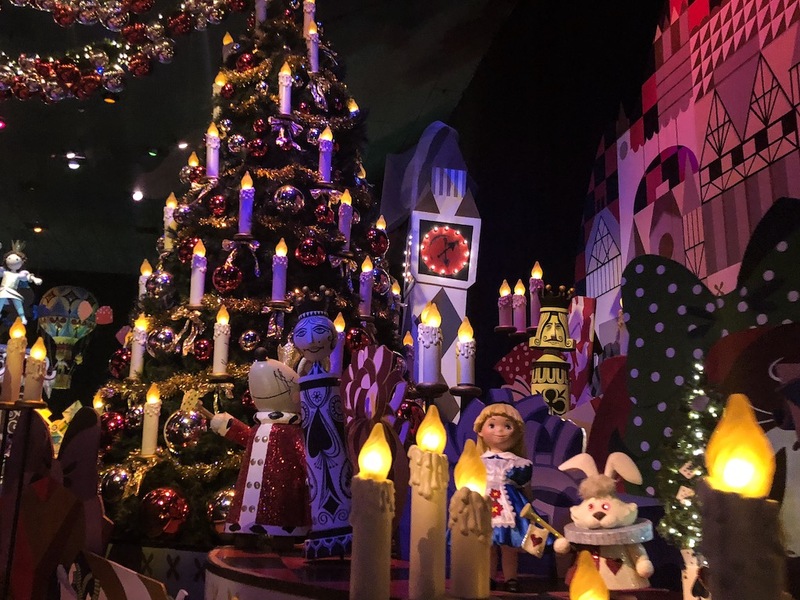 Stop by with the entire family and enjoy the Christmas wonderland from November 9th to January 6th. 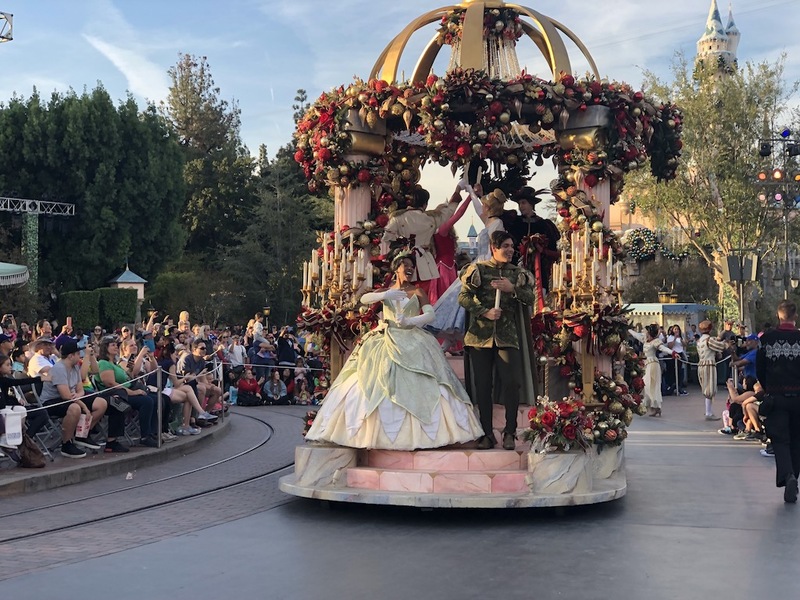 If you have never been before or just need a quick refresh on what to expect at the Disneyland Resort, we have quick overview below. 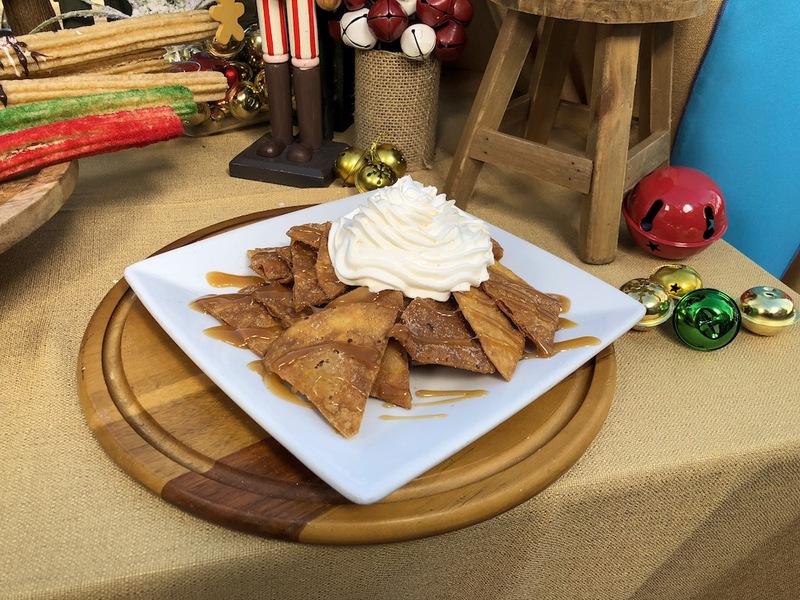 This holiday season Disney has stepped up their game just like they did for all the Halloween food. 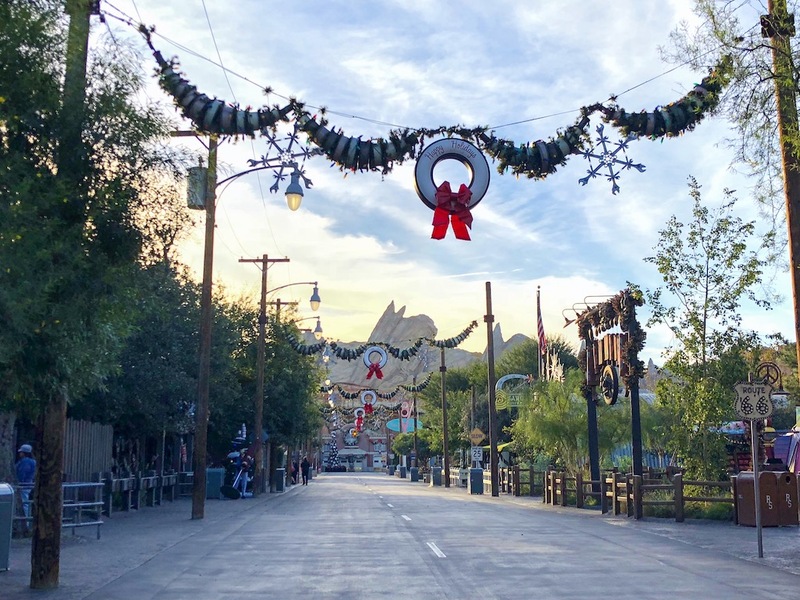 Between the two parks there are so many alluring options and an added bonus with the Festival of Holidays that is in Disney California Adventure. 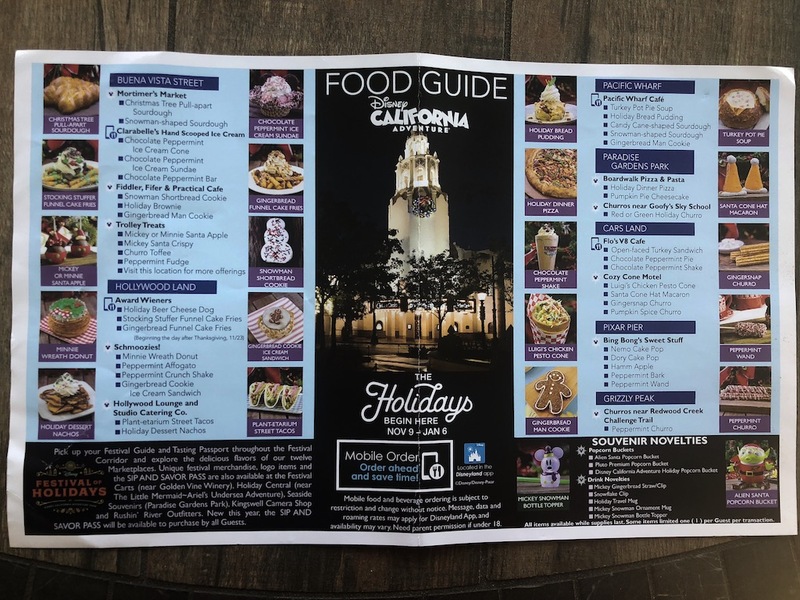 The Disneyland Resort has once again made a helpful food guide with all the seasonal offerings guests can enjoy. 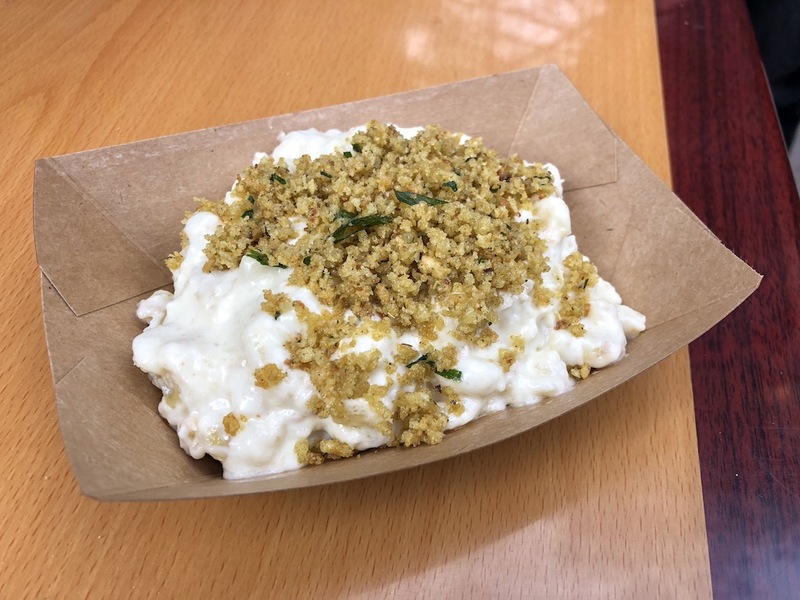 Festival of Holidays is a foodie’s dream come true. 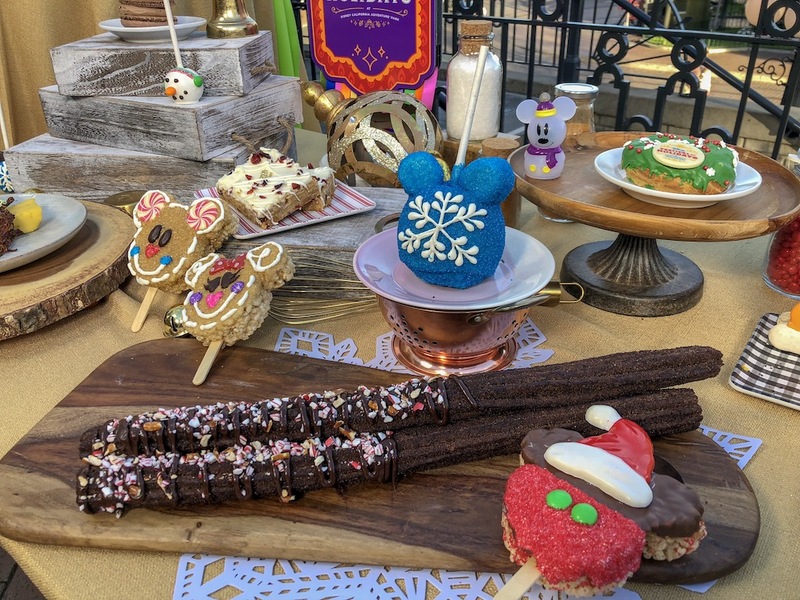 The Festive Foods Marketplace is set up along the main walkway from Carthay Circle to Paradise Gardens Park. Make sure to grab a Tasting Passport before starting in this merry adventure. 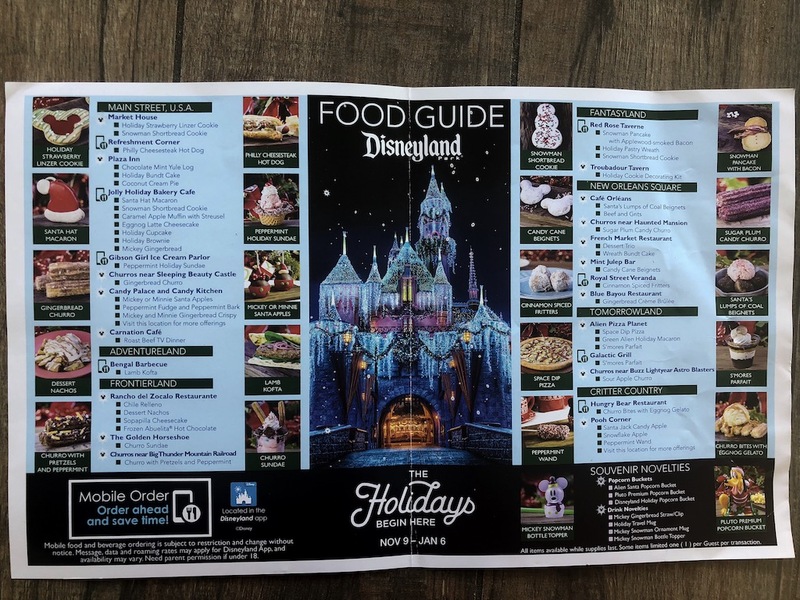 In the guide, guests can flip through the food options for all 12 Marketplace locations. There is also an allergy guide in the Tasting Passport for guests to quickly identify which items they can have. 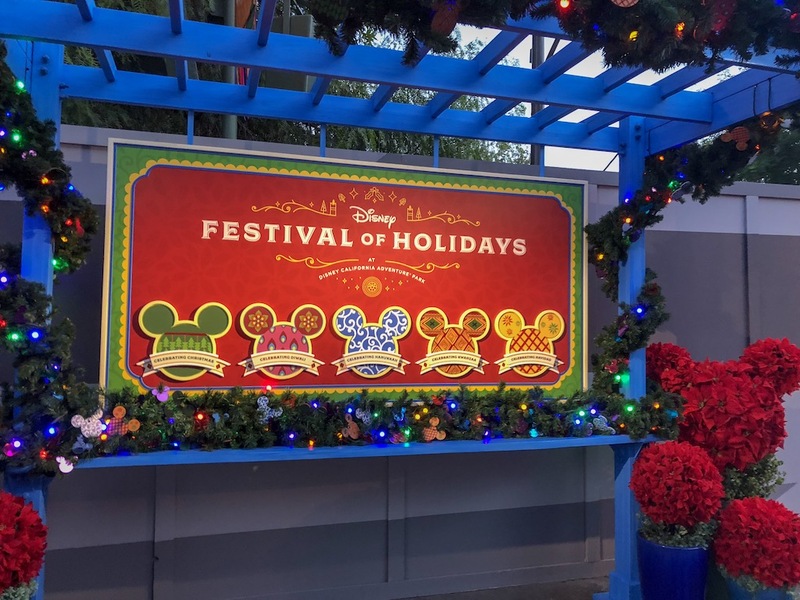 This year, we have not heard any more information on whether or not the World of Color holiday show will be coming back, but fear not, there are plenty other shows to get you in the Christmas spirit. First up, let’s start off in Disney California Adventure. 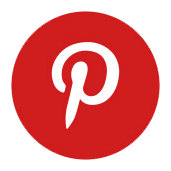 Because of the Festival of Holidays there will be ongoing musical entertainment throughout the day like Mostly Kosher (a klezmer jazz and rock band honoring Hanukkah), Blue13 Dance Company (celebrating Diwali with traditional dances from Bollywood), and the unforgettable Mariachi Divas (playing classic holiday songs with a festive twist). 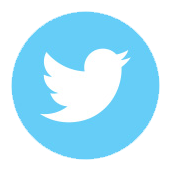 This park truly comes alive with all the entertainment throughout the day. 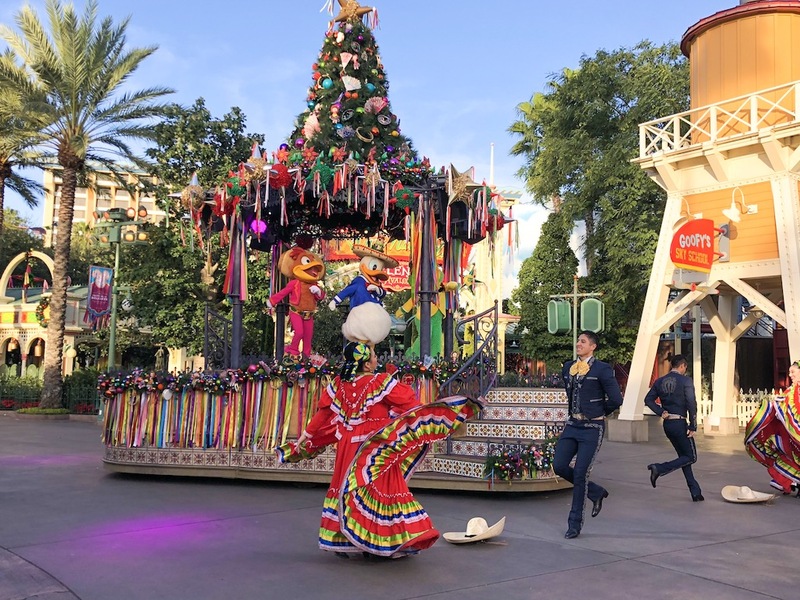 Heading towards Paradise Gardens Park make sure to check out all of the ¡Viva Navidad! 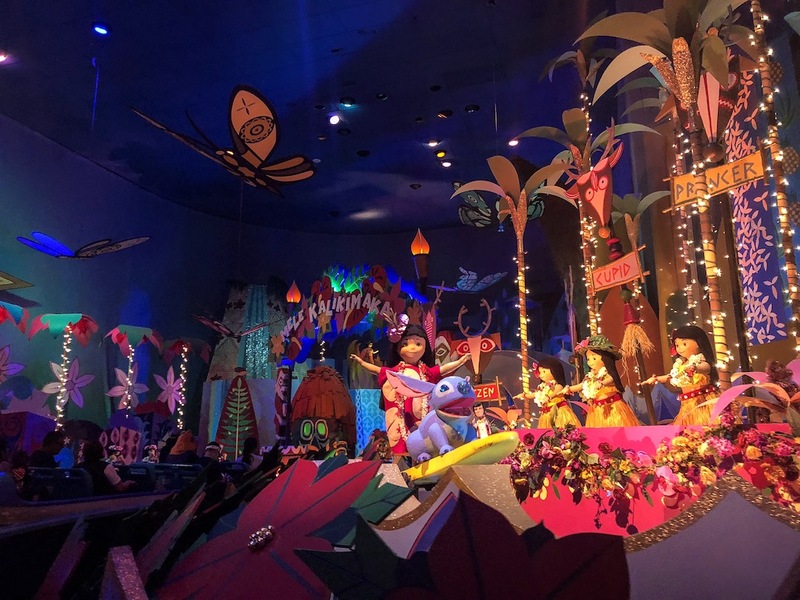 celebrations, including the Disney ¡Viva Navidad! Street Celebration that happens throughout the day. 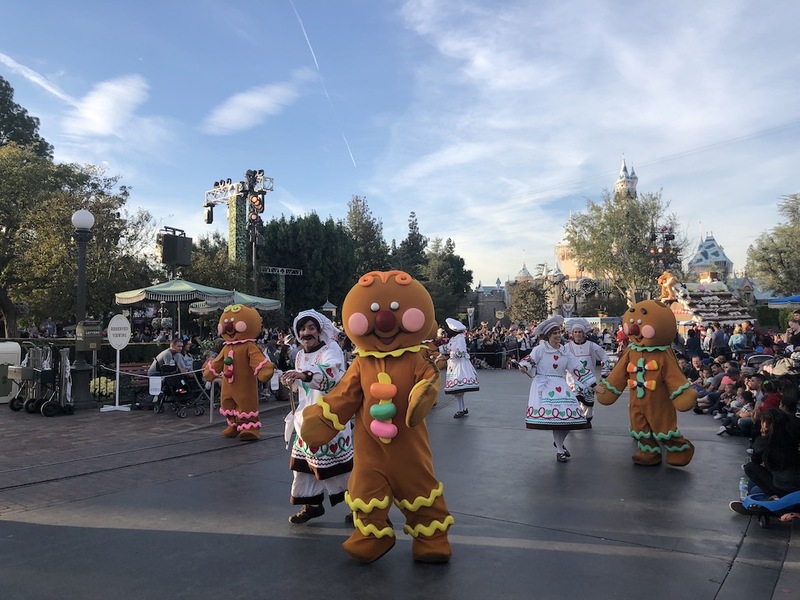 Join the Three Caballeros, the folklórico dancers as they celebrate their Hispanic roots, and samba dancers and musicians celebrating Brazil, joining into one joyous celebration with mojiganga puppets of Mr. and Mrs. Claus and a special appearance by Mickey and Minnie. This is one grand fiesta that will have everyone dancing along. 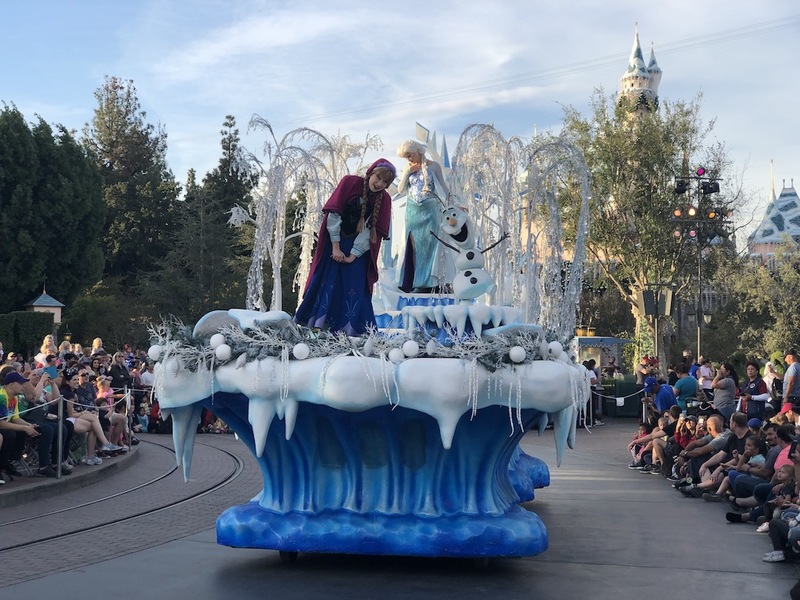 Lets dash our way over to Disneyland Park and talk about their entertainment. 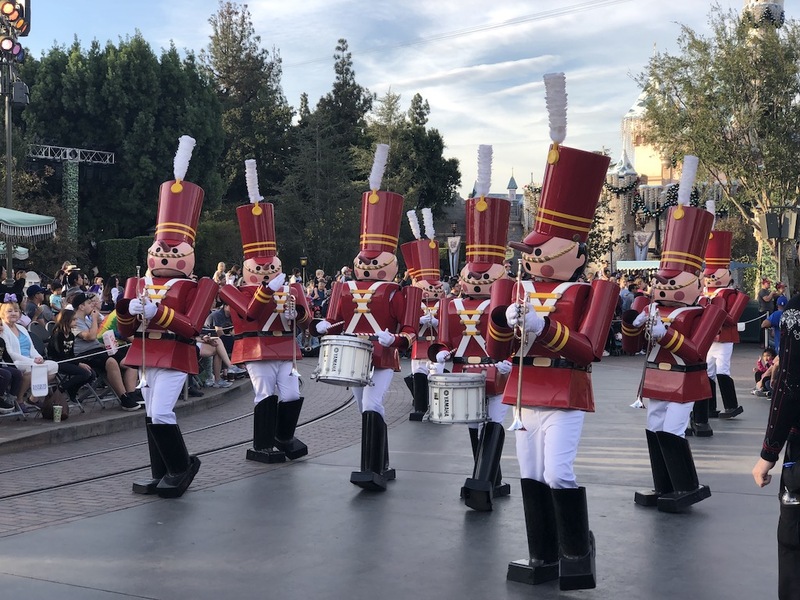 Happening two times a day is A Christmas Fantasy Parade, where guests will enjoy favorite characters like Mickey and the gang, Disney Princesses, prancing reindeer, marching toy soldiers, and Santa Claus. 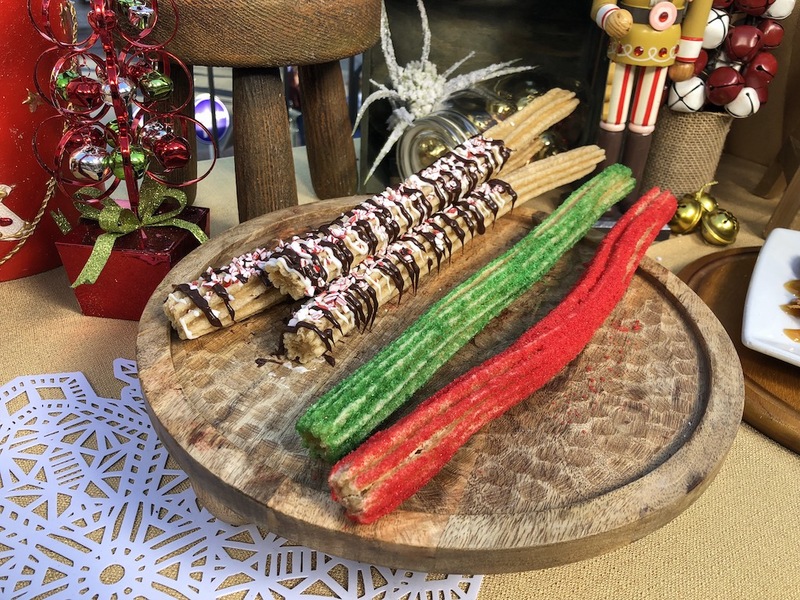 Finish off the night of yuletide bliss with the Believe… In Holiday Magic fireworks. 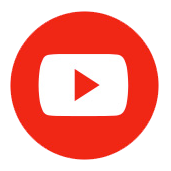 This truly amazing pyrotechnic artistry will take your breath away and have you twirling around at the end with the whimsical snowfall. 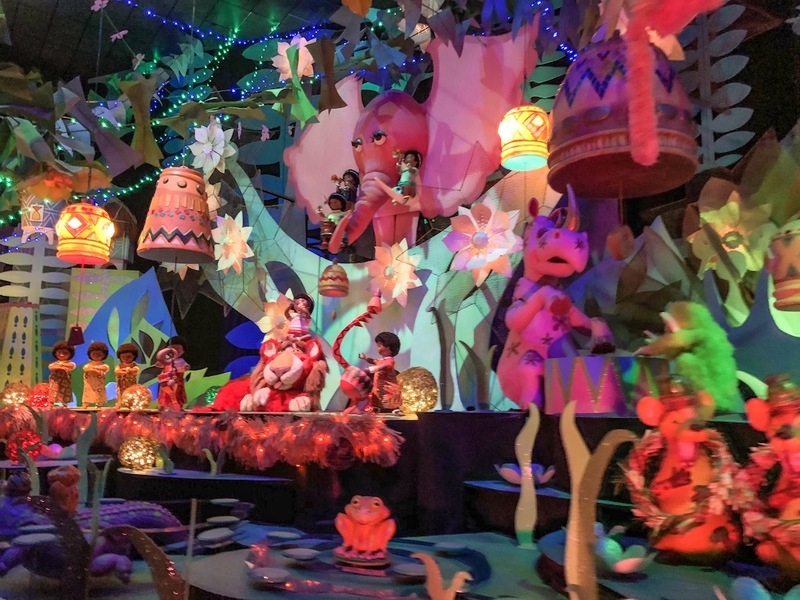 The special projection viewing areas are at “it’s a small world” Holiday in Fantasyland, along Main Street, U.S.A, Rivers of America, and Sleeping Beauty Castle. 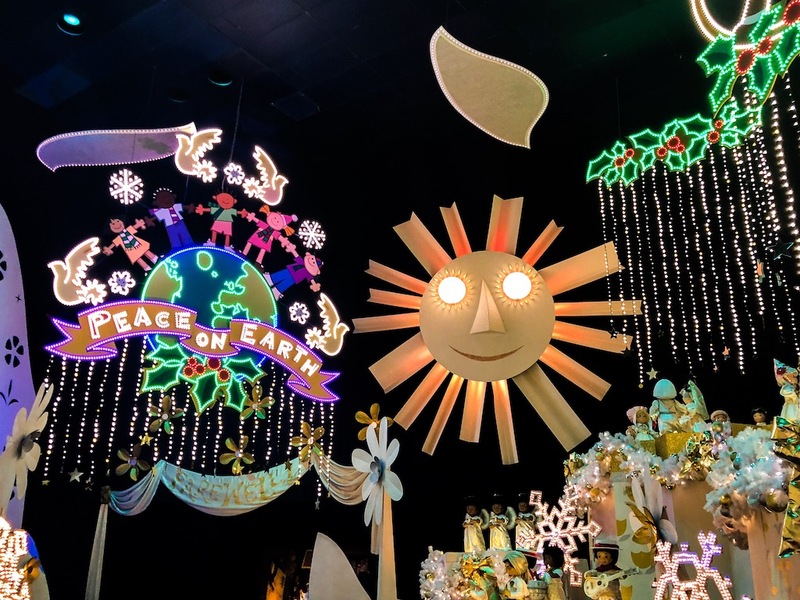 “it’s a small world” Holiday is back and joining the nations we all know and love into one huge yuletide celebration. 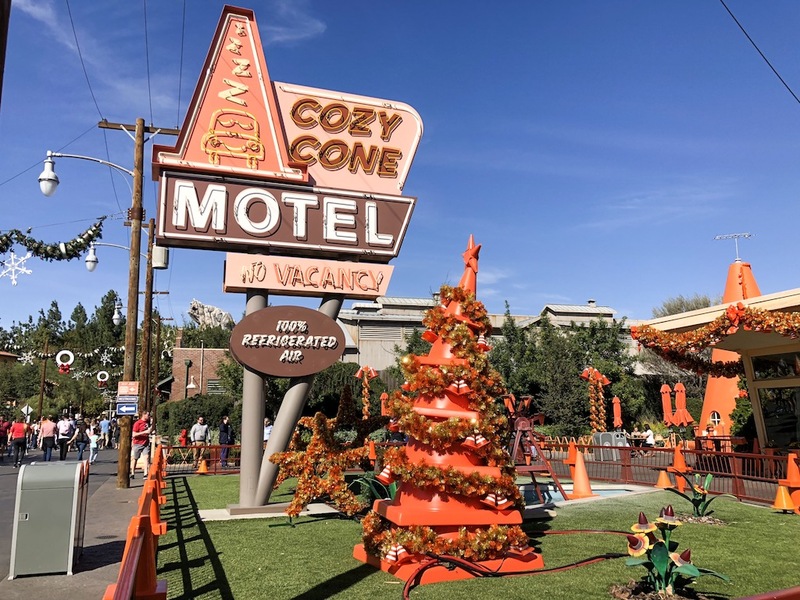 Radiator Springs has been souped up for the Holidays and all around this little town each location has its own personalized decorations to celebrate another year of Season Speedings. 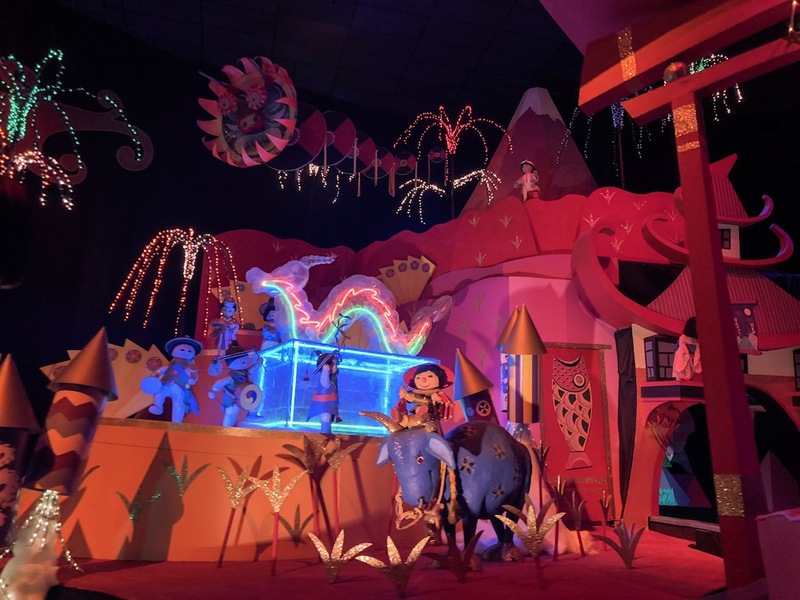 Luigi’s Rollickin’ Roadsters has been transformed into Luigi’s Joy to the Whirl, where Luigi and Guido celebrate the holidays with the whole famiglia singing holiday tunes from Carsoli. 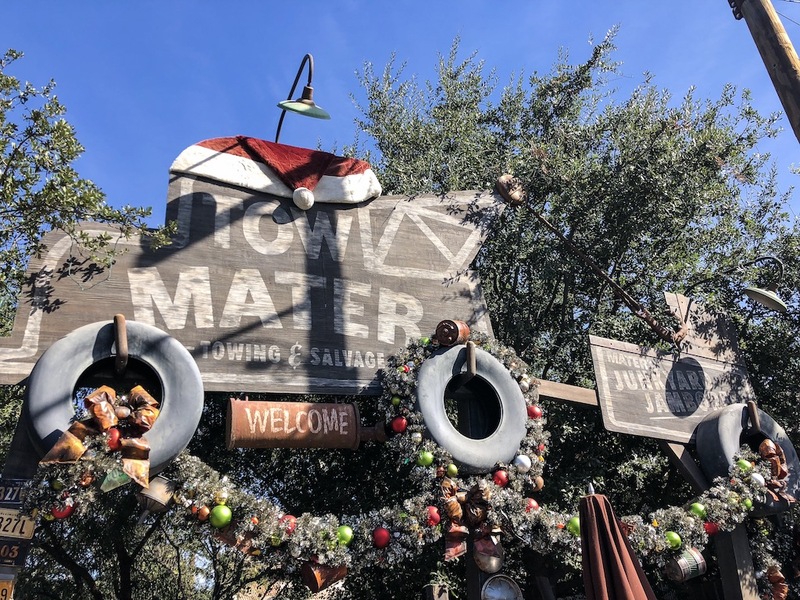 Mater even decorated his junkyard jamboree into Mater’s Jingle Jamboree. Take a spin on one of his jolly tractors as he sings festive holiday tunes. 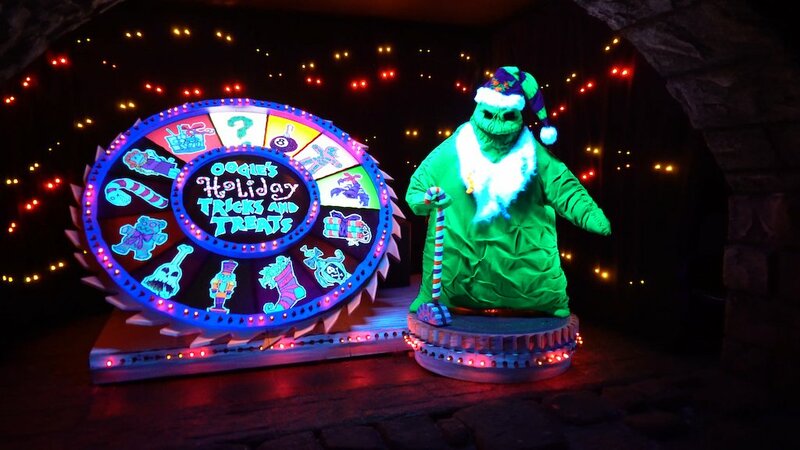 Haunted Mansion Holiday has been carried over from the Halloween season — Come visit Jack as he dresses up as “Sandy Claws” and delivers ghoulish delights from Halloween Town to all the 999 happy haunts who dwell in the Haunted Mansion. 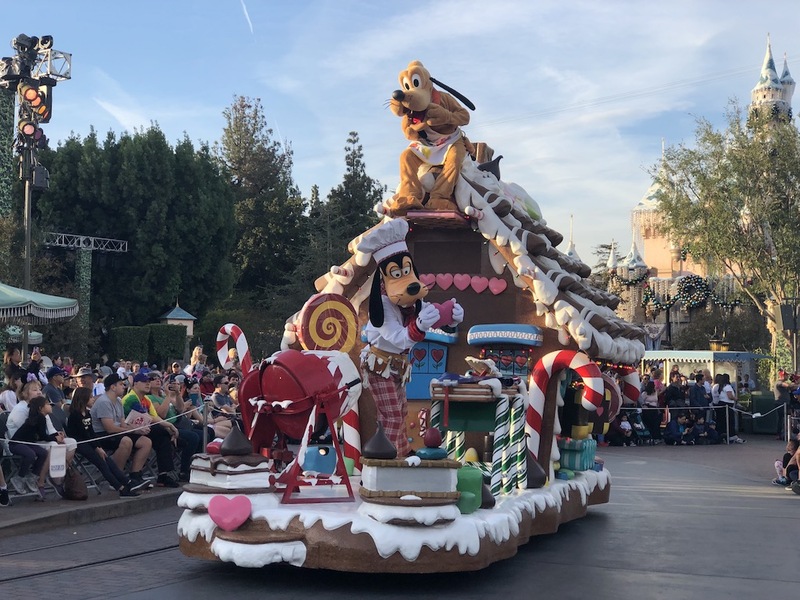 A trip to Disneyland cannot be complete without a few photos marking your holly, jolly day. 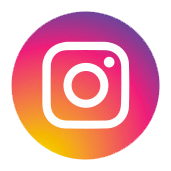 Here are just a few locations that will have your Instafollowers liking every photo. 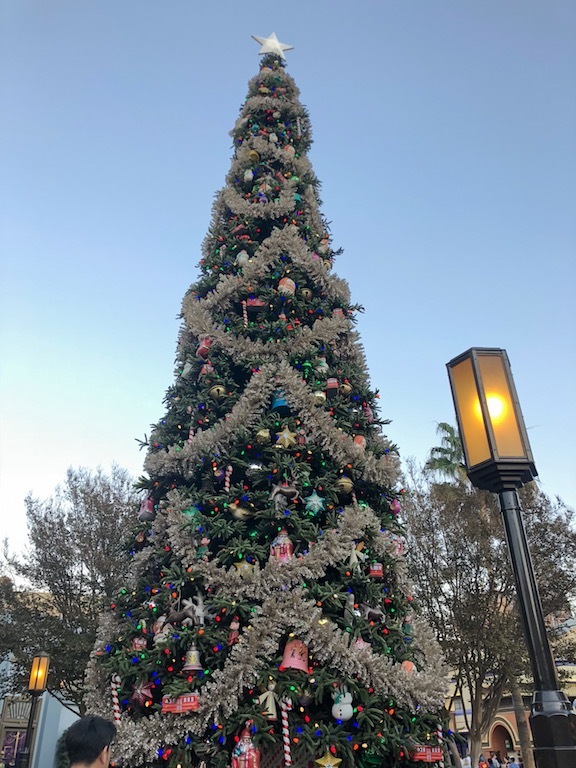 The Disneyland Tree and Disney California Adventure Tree are both great to take a picture in front of during the day. 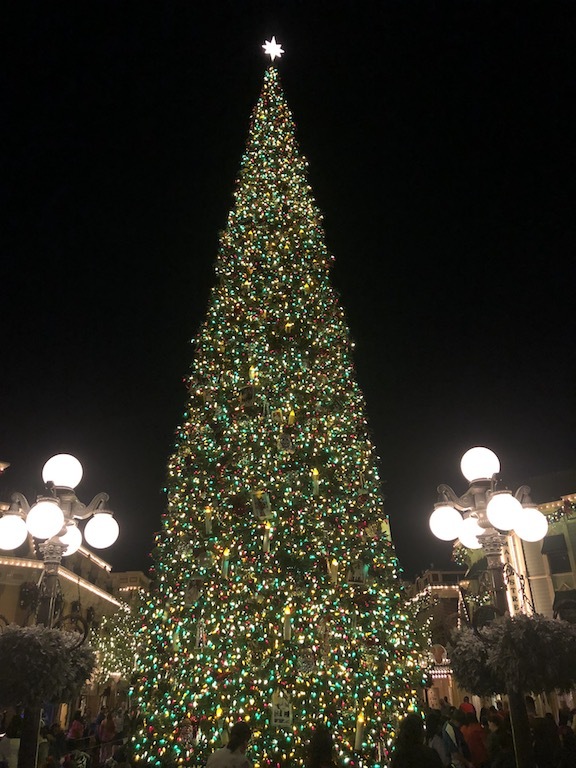 The Disneyland tree stands 60 feet tall right in the heart of Town Square, Main Street U.S.A. This picturesque tree has all new lighting, Victorian-inspired ornaments, and faux candles. 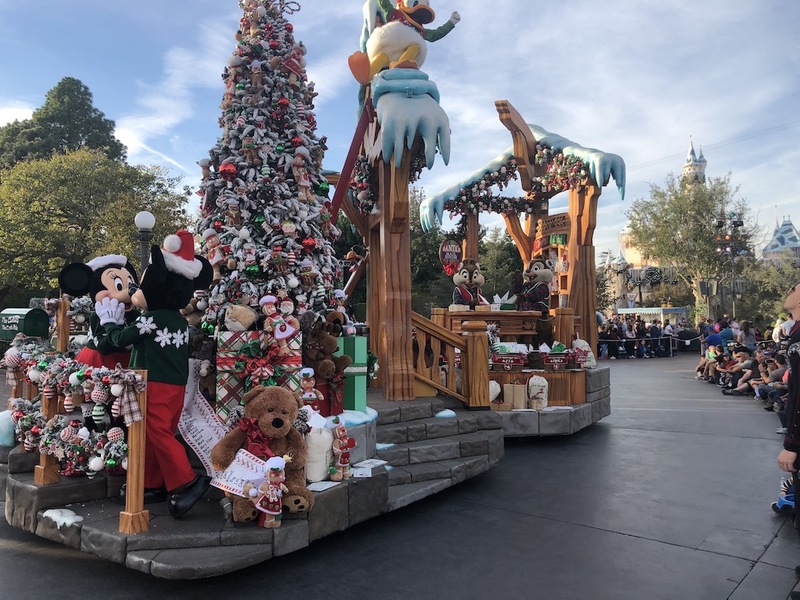 Over on Buena Vista Street guests will be amazed by the 50-foot Christmas tree inspired by 1920’s Los Angeles, when Walt Disney came to town with only a suitcase and a dream. 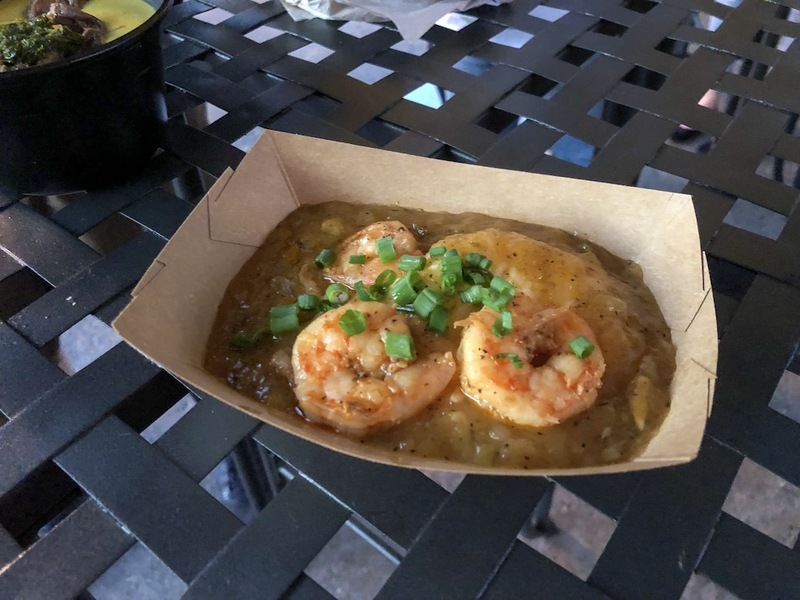 Listen closely, you may hear a choo choo train go by. 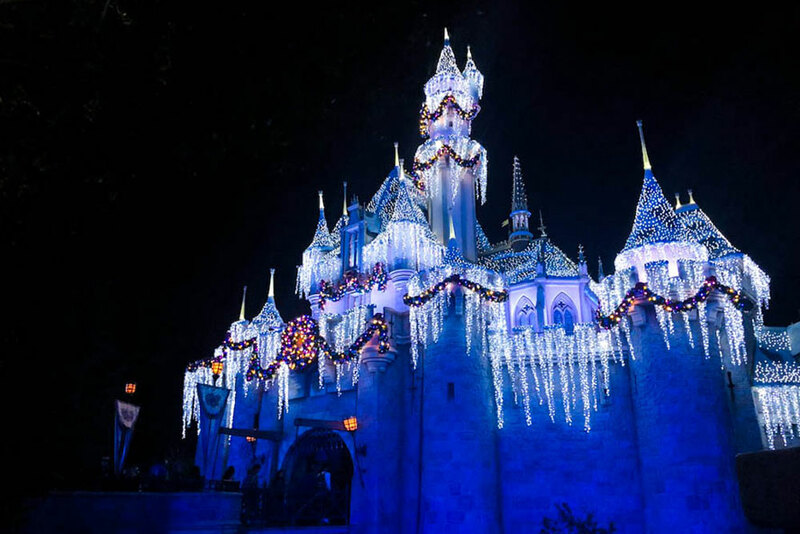 A visit to Sleeping Beauty Castle is always a must, but during Christmas it is even more charming because of the shimmering snow-topped turrets decorated with twinkling “icicles,” wreaths, and festive decor. This location is great to take pictures in front of both day and night. 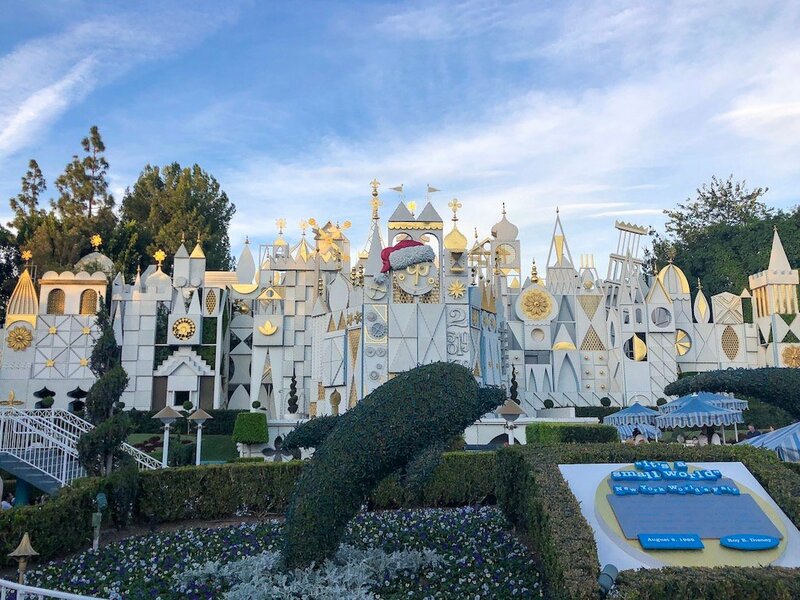 Before setting sail on a mesmerizing cruise filled with holiday tunes, make sure to take a picture in front of the iconic facade of “it’s a small world” Holiday, which has been decorated with thousands of Christmas lights — the adorable clock is adorned with a Santa hat smiling at all the good girls and boys. 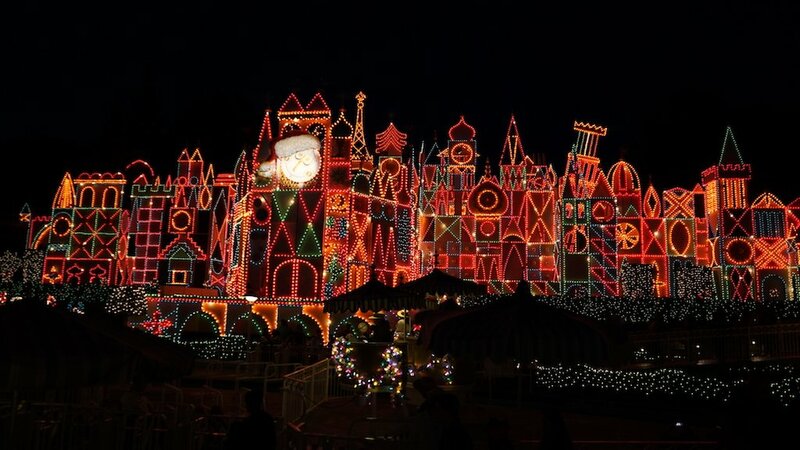 Tip: If you have never seen “it’s a small world” lit up for the holidays, stick around and watch it at night. 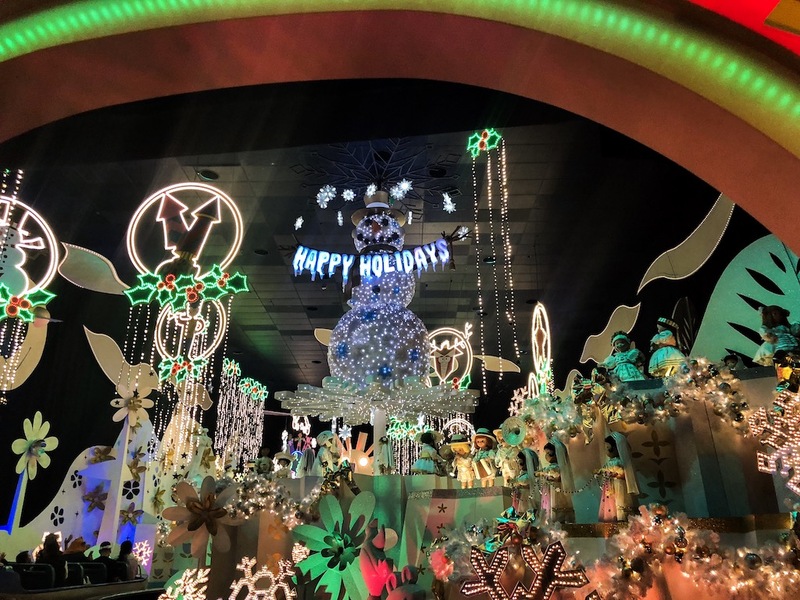 It is simply dazzling to look at and will fill you with holiday cheer! Try taking a ride on the monorail starting from Downtown Disney and ending in Tomorrowland during the evening. Once the monorail turns the corner around Autopia, it will take your breath away on how how grand the facade looks. Every 15 minutes a spectacular projection show will happen. 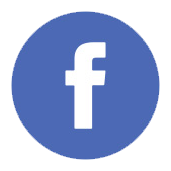 Last and certainly not least are meet and greets. 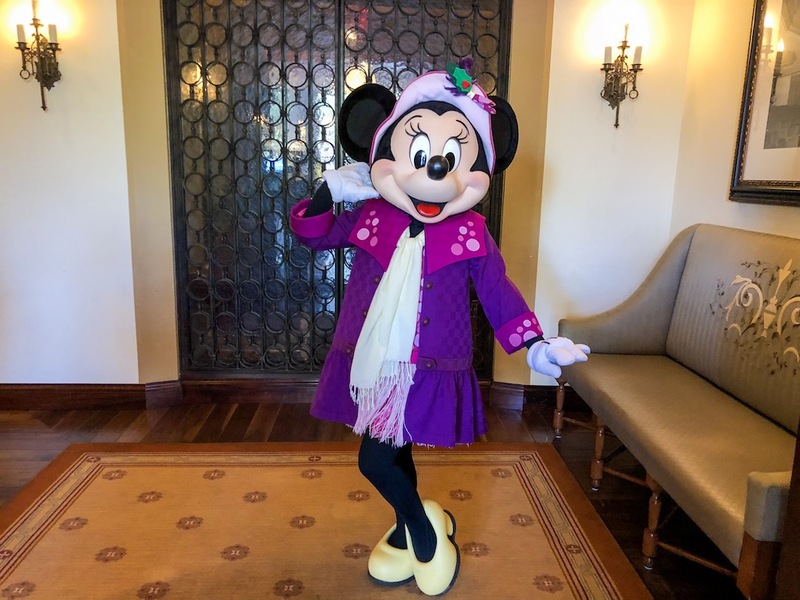 Characters all around the Disneyland Resort are dressed up for the winter season. 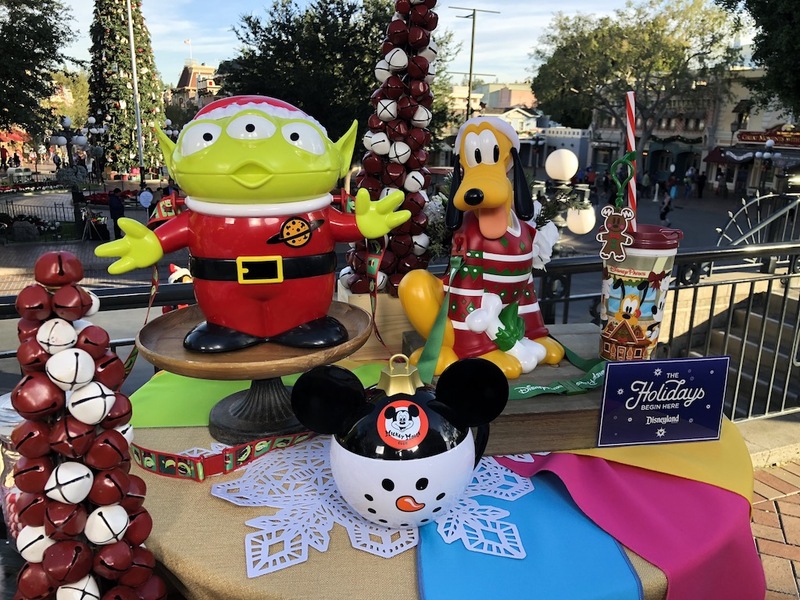 If you love taking pictures with characters, these are a must! And let’s not forget the most popular person of all during the holidays: Santa Claus! 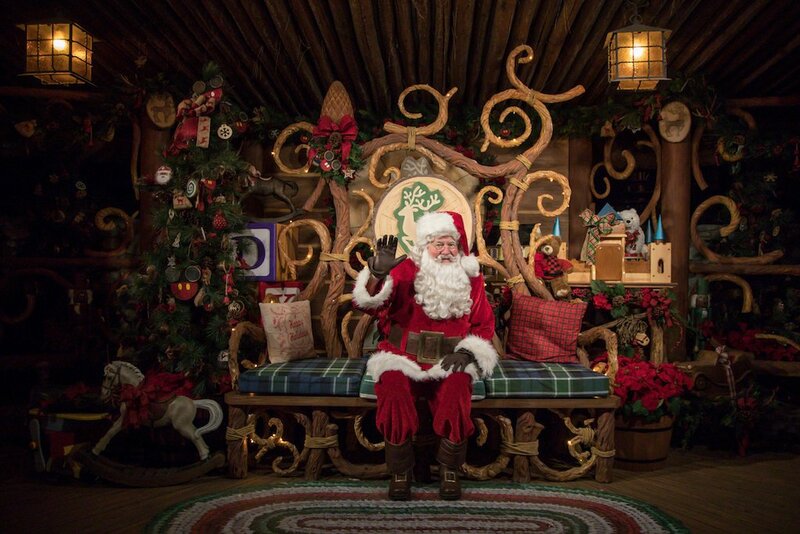 Over at the Redwood Creek Challenge Trail guests can line up and meet Old Saint Nick along with his elves through December 24th. 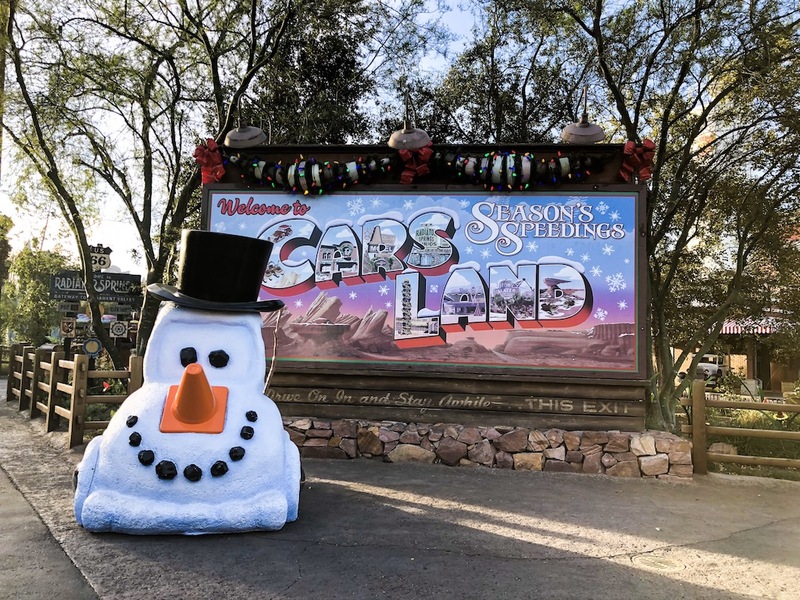 Starting December 25th through January 8th, Santa Goofy will take his place. 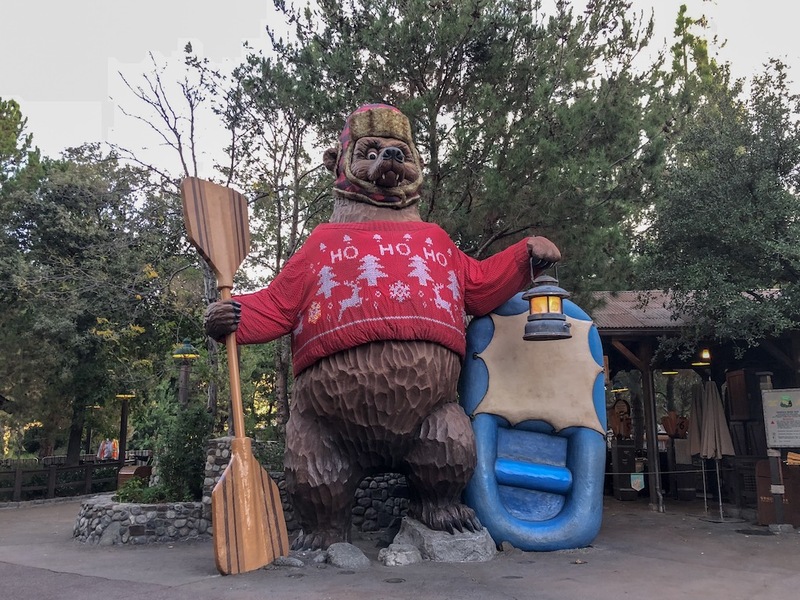 Tip: To experience an enchanting winter touch of occasional snowfall, take a merry stroll through Grizzly Peak. 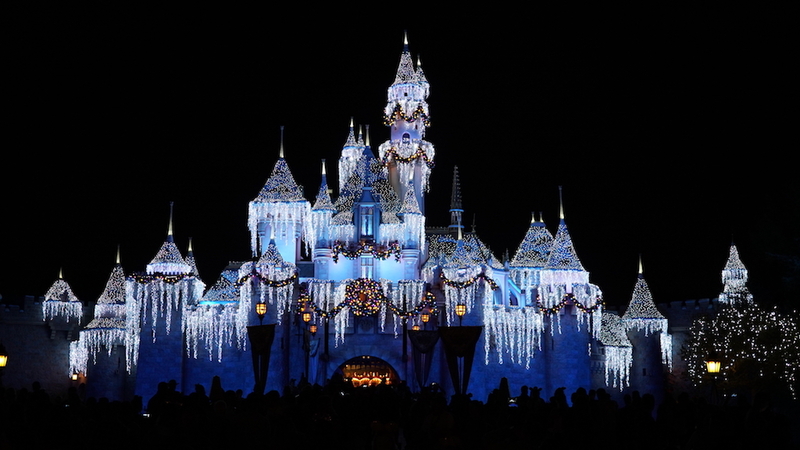 It is truly a magical sight and is a brand new experience this year.